A client needed help with developing a brazing application for their manufacturing process, so they turned to THE LAB at Ambrell. 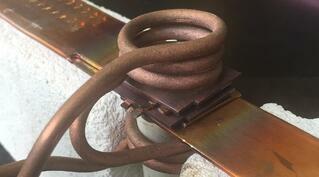 The application involved heating copper strip assemblies to 1400 oF (760 oC) for brazing. The end product is used in the transformer industry. The fact that copper strip assemblies of varying sizes required heating was taken into account when the coil and power supply were selected. Ambrell's applications engineers determined that an EKOHEAT 30 kW 50 to 150 kHz induction heating system would be optimal for this application. A single position multi-turn split helical coil was used for the application. Braze alloy wire was placed between the copper strips and the power was turned on. The assemblies required 15 to 20 seconds of heating in order for the braze alloy to flow. A major benefit of using induction brazing for this application is repeatability. The client will get an identical result time after time, which can lead to enhanced quality. Additionally, induction is rapid which increases throughput. Finally, an EKOHEAT 30 kW system requires a modest footprint, especially when you consider that the workhead can be placed 100 feet (30 m) away from the unit itself. If you'd like to learn more about brazing, check out our Brazing Guide.